Last week, a Philippine Navy official provided an update of where the country is with respect to its anti-submarine warfare helicopters, which are set to arrive later this year. While this is just one of several notable developments within the country’s ongoing military modernization, it nonetheless bears noting given the boost it would constitute for Manila’s capabilities. As I have observed before in these pages, the Philippines, which remains one of the region’s weakest militaries, has been on an ongoing effort to boost its defense capabilities over the past few years in the face of a range of internal and external challenges. That effort continues to be pursued under President Rodrigo Duterte, albeit with a mix of continuity and change and amid a range of trends and developments. One of the deals in this respect occurred back in 2016, when the Philippine Department of National Defense (DND) awarded Leonardo a 5.4 billion pesos ($101 million) contract for the two aircraft under the country’s Anti-Submarine Helicopter Acquisition Project. While the deal was no doubt a headline-grabbing development given the fact that Manila had lacked an airborne anti-submarine warfare capability, there has since been continued attention to when exactly it would actually be acquired, with the most recent accounts suggesting that the first two of them would be arriving sometime in May. This week, the delivery of the capability was in the headlines again with an update about an ongoing inspection of it. According to the Philippine News Agency (PNA), citing comments by Navy spokesperson Jonathan Zata, a defense delegation, led by Robert Empedrad, was in the process of an inspection process in the United Kingdom ahead of the delivery. Per Zata, Empedrad, along with the Department of National Defense (DND) test and inspection team, were performing various checks on the aircraft as part of a pre-delivery inspection of the two A1-159 helicopters, which were said to be proceeding to a level that would allow for a delivery ahead of the scheduled time. There were various aspects to this, including Empedrad being flown on both the aircraft to assess performance on counts such as stability and maneuverability. For now, Zata said that the test and pre-delivery inspection was proceeding smoothly, and all indications are that the aircraft will be shipped and delivered in Manila by the first week of May at the latest. Should that occur as scheduled, it would mean that that the PN would have the opportunity to showcase it as part of its 121st anniversary celebrations on the last week of May, where it would no doubt be one of the highlights to come out of it. 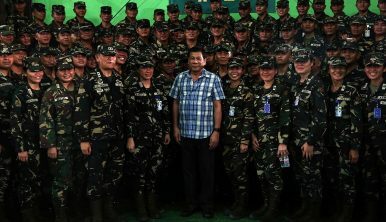 Where Is the Philippines’ Air Force Modernization Under Duterte?Philippines Receives Second Indonesia-Built WarshipNew Missile Test Highlights Philippines Military Modernization Under DuterteWill the Philippines Navy Attack Crafts Get More Israel Missiles?What Does the Philippines’ New Attack Helicopters Deal Mean for its Military Modernization?